There are 48 Assisted Living Facilities in the Hales Corners area, with 3 in Hales Corners and 45 nearby. The average cost of assisted living in Hales Corners is $3,700 per month. This is higher than the national median of $3,346. Cheaper nearby regions include West Allis with an average starting cost of $3,068. To help you with your search, browse the 197 reviews below for assisted living facilities in Hales Corners. On average, consumers rate assisted living in Hales Corners 4.3 out of 5 stars. Better rated regions include Greendale with an average rating of 4.6 out of 5 stars. Caring.com has helped thousands of families find high-quality senior care. To speak with one of our Family Advisors about assisted living options and costs in Hales Corners, call (855) 863-8283. Hales Corners, which sits in the southeast corner of Wisconsin, was established by Ebenezer Hale and his two sons, who each purchased adjoining properties in the area. Now forming the intersection of Janesville Road and Highway 100, the area is home to just under 7,800 people. There are about 2,793 seniors, the majority of which are between 55 to 59 years old. For seniors who need an assisted living facility, three communities are in the city. An additional 56 ALFs are in nearby towns and cities, including Greendale and Wauwatosa. All ALFs in Hales Corners and within the state provide services related tohealth monitoring, transportation, personal care and leisure activities. They are under the jurisdiction of the Wisconsin Department of Health Services, Bureau of Assisted Living, Division of Quality Assurance. Hales Corners will neither harm nor help a senior’s tighter budget. The overall cost of living for the area is just 0.8 percent higher than the national average. Health and utilities are the areas with the highest rates seniors will need to plan for. Hales Corners, Wisconsin, is a fairly safe place for seniors and their families, as both property and violent crime rates are below average (30.6 versus 38.1 and 23.2 versus 31.1, respectively). This might let seniors focus on enjoying their retirement and get out into the community better. The climate for Hales Corners, Wisconsin, produces a Sperling’s Comfort Index of 42 out of 100 (100 is best). While this is lower than the national average of 54, it’s comparable to other areas of the state and wider Midwest. Seniors might struggle through the winter in terms of transportation, outdoor access and physical comfort, as lows get into the mid-teens and snowfall is 19 inches higher than average. The air quality in Hales Corners is good, ranking 72 out of 100 on the EPA National Air Toxics Assessment. The average for the country, by comparison is 58. The cleaner air might alleviate symptoms of certain respiratory conditions common to seniors, such as asthma and infections. Seniors can get around Hales Corners, Wisconsin, through the Milwaukee Country Transit System. This service provides discounted rates to riders 65+, with most fees falling around half the regular ticket price. Hales Corners is home to world-class medical facilities, including the Post Acute Medical, in the event of medical emergencies or illness. Assisted Living costs in Hales Corners start around $3,700 per month on average, while the nationwide average cost of assisted living is $4,000 per month, according to the latest figures from Genworth’s Cost of Care Survey. It’s important to note that assisted living rates in Hales Corners and the surrounding suburbs can vary widely based on factors such as location, the level of care needed, apartment size and the types of amenities offered at each community. 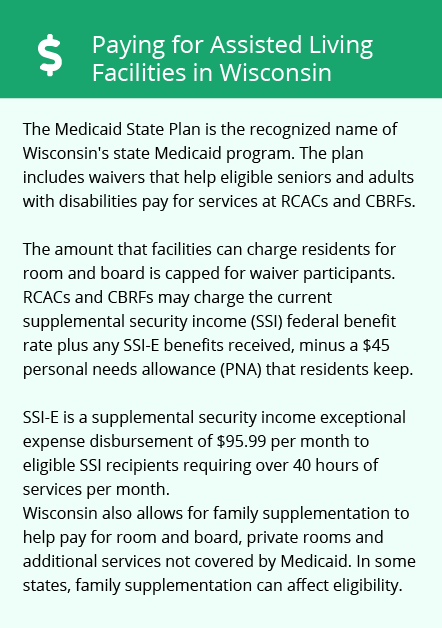 If a senior in Hales Corners needs additional funds to meet ALF expenses, they should consider the state’s SSI Exceptional Expense Supplement (SSI-E). Hales Corners and the surrounding area are home to numerous government agencies and non-profit organizations offering help for seniors searching for or currently residing in an assisted living community. These organizations can also provide assistance in a number of other eldercare services such as geriatric care management, elder law advice, estate planning, finding home care and health and wellness programs. To see a list of free assisted living resources in Hales Corners, please visit our Assisted Living in Wisconsin page. Hales Corners-area assisted living communities must adhere to the comprehensive set of state laws and regulations that all assisted living communities in Wisconsin are required to follow. 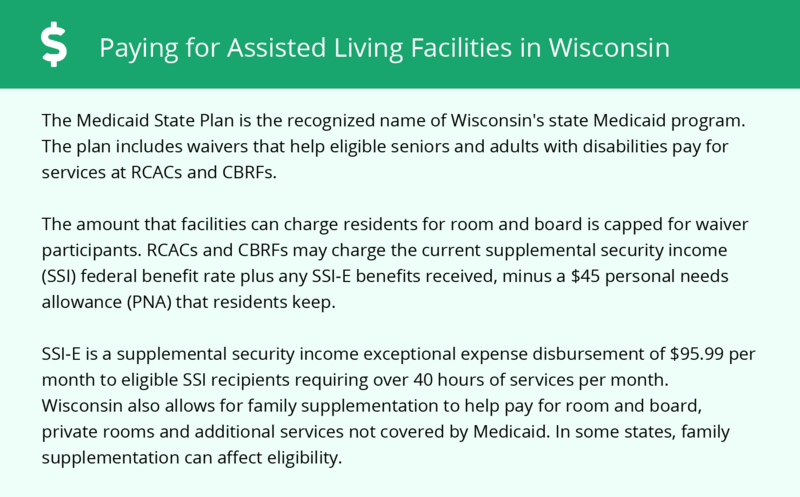 Visit our Assisted Living in Wisconsin page for more information about these laws.